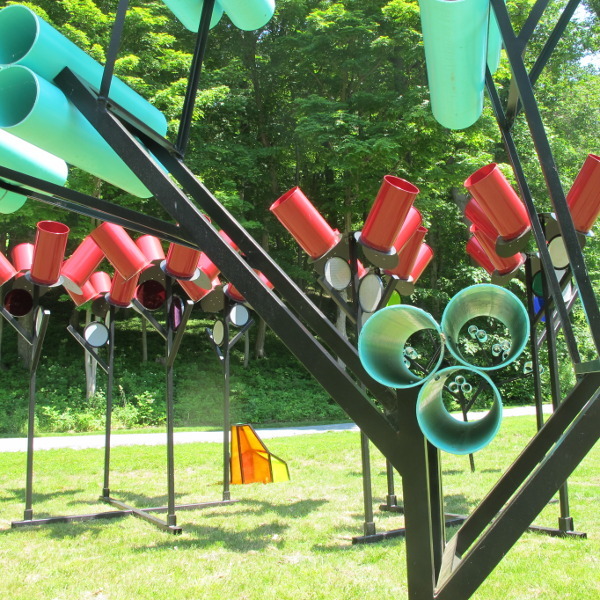 In early June, after delivering a pair of custom mirrors to northern New Jersey, Jay and I drove on to Storm King Art Center near New Windsor, New York. 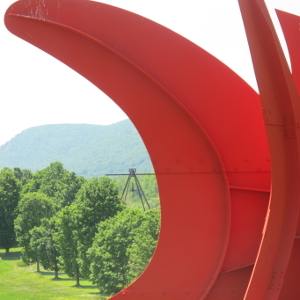 Storm King is an outstanding sculpture park on 500 acres in the lower Hudson Valley. 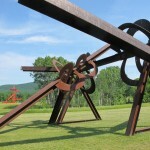 The sculpture park lies between its namesake Storm King Mountain, several miles to the east, and Schunnemunk Mountain to the west. 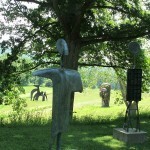 The Storm King Art Center was established in 1960 through the efforts of Ralph E. (Ted) Ogden and H. Peter Stern. Ogden’s foundation purchased a handsome stone residence built in 1935 and its surrounding 200 acres. Over a period of years, Ogden and Stern’s company, The Star Expansion Company, purchased and donated an additional 300 contiguous acres and secured 2,100 acres of Schunnemunk Mountain, now a New York State Park, to protect the art center’s view. As the art center became committed to modern sculpture, purchases were placed in a formal garden scheme surrounding the house. 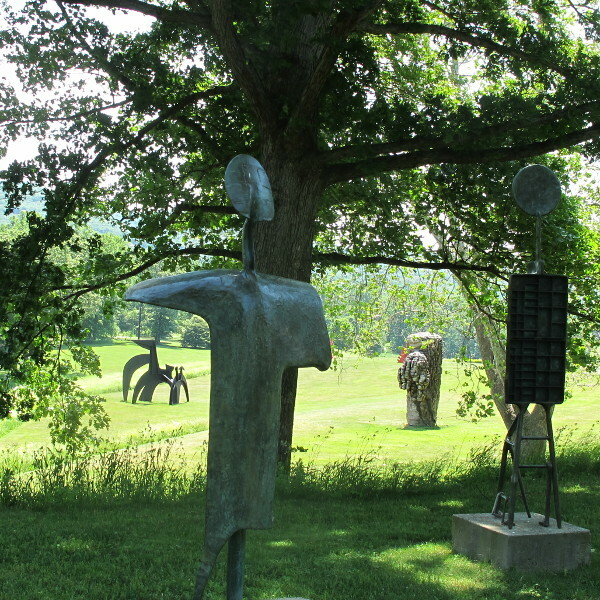 In 1968 Storm King purchased thirteen David Smith sculptures from his estate and installed several in the landscape. 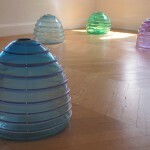 Since then all sculpture has been placed with an eye to not only immediate surroundings but also distant views. 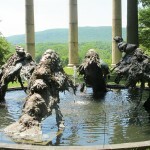 By the time we arrived at Storm King, touring had to wait for lunch. Although the art center has a cafe, we had brought along a picnic, sandwiches made with Jay’s bread and a few raw vegetables from the garden. We ate under a large shade tree, with a view through Mark Di Suvero sculptures to Schunnemunk Mountain. The sun was high in the sky and the temperature about 80 degrees F by the time we put the cooler back into the car and started to walk up Museum Hill. Under tall trees at the top of the hill we found Emilio Greco’s “Tall Bather No. I,” an elegant, modern form with classical associations. 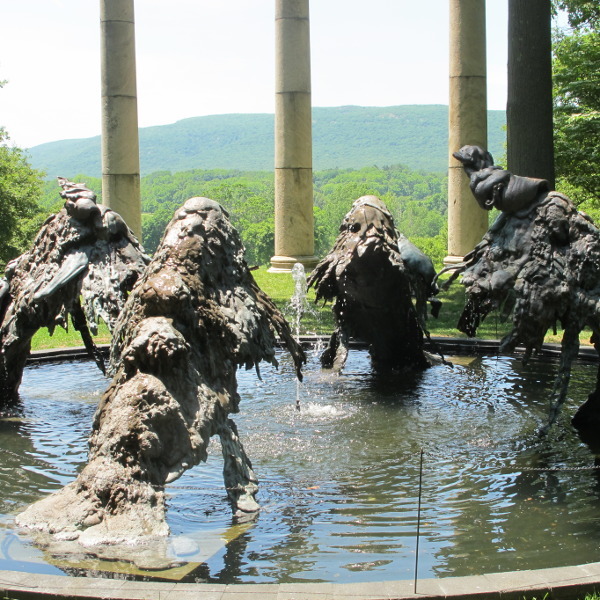 Nearby, Lynda Benglis‘ dripping bronze fountain figures (“North, South, East, West”) contrast with Ionic columns at the end of the original home’s gardens. Restored and inspired by that stop, we walked on up and into the North Woods and soon faced an imposing Barnett Newman sculpture. “Broken Obelisk” seems both ancient and new, immovably solid and perilously close to toppling. Despite the sculpture’s 25-foot height and massive weight, the pyramid and obelisk are joined at a point only two inches across. “Broken Obelisk” is the largest of only six sculptures Newman created during his career. It exists in four editions, another of which Jay and I saw in 1992 at the Rothko Chapel in Houston. That edition is currently undergoing restoration by the original fabricator in Connecticut. 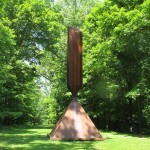 The first three versions of this work were fabricated in Cor Ten steel the 1960s and in 2003 the Barnett Newman Foundation gave permission for one more edition. The fourth edition was completed in 2006 and installed in front of the Neue Nationalgalerie in Berlin for two years before being acquired by Storm King. The woods were lovely and dark and deep . 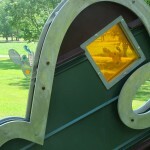 . . with sculptures placed in clearings and among the trees. One of Josephine Halvorson’s “Measures,” a special exhibition (Outlooks: Josephine Halvorson) of three site-specific works, is metal thrusting from the earth and painted to resemble tree bark. On one side of the trompe l’oeil sculpture Halvorson painted a red line from top to bottom to ensure that the viewer considers the difference between sculpture and a living tree. Along the trail we passed a “Man With a Hat” (Kosta Alex); a “King” (Lee Tribe); and a 16′ x 13′ x 12′ cloud (“Kumo” in Japanese, by Isaac Witkin). Anthony Caro‘s Cubist “Bitter Sky” was beautiful in a clearing, under a bright sky. Rounding a bend on more level ground, we caught sight of George Cutts’s captivating “Sea Change.” Two identical, slim, curving, stainless steel poles slowly rotate in opposite directions. The kinetic sculpture induced us to stop and study the poles–were they identical or not?–and give in to the graceful, mesmerizing movement. Not far ahead we came to Dennis Oppenheim’s “Alternative Landscape Components: Red Rocks, Straight Trees, Small Bushes.” The colorful components are part of the Oppenheim special exhibit, “Terrestrial Studio,” the artist’s term for certain of his outdoor sites. 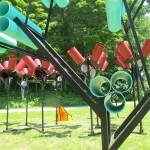 Further on we found his “Architectural Cactus Grove,” a third of the eighteen cacti sculptures Oppenheim created. 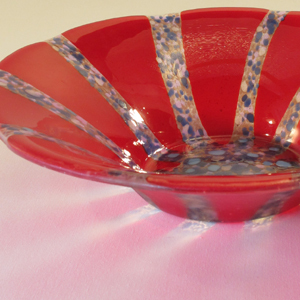 The surface of each of six different shapes in the series is designed in various colors and materials, so each sculpture is unique. The series was first produced as a public artwork for a desert location at Scottsdale, Arizona. Observing that the site was across from a police station, Oppenheim designed the cacti to fit together like puzzle pieces, a reference to detective crime-solving efforts. Our climb back up Museum Hill was rewarded by good views of large sculptures on a long, flat field, including a site-specific commission by Robert Grosvenor. His untitled work, what appears to be an extremely long black beam, a third of which rests on a black rectangle, with both ends extending downward to the ground, is 212 feet long and only 12 inches wide. Beyond its simple silhouette, the Schunnemunk Mountain ridge stretched serenely green. Along our rising path we paused several times to study, among other works, “Forms in Movement (Pavan)” and “Square Forms with Circles,” both by Barbara Hepworth, and “Wayside Drainpipe” by Claes Oldenburg and Coosje van Bruggen, the largest of the drainpipes that the two completed. The husband-and-wife artists proposed many public drainpipe monuments and completed a few indoor versions. Oldenburg’s own words about this project: “The drainpipe has a pool at the top. The water runs down through the pipe, and then out into this waterfall at the bottom. And actually, the top is a landing strip for planes; so that you land on a hard surface over the water. People are swimming in the water, so they can look up at the planes landing on top of them and see the passengers get out.” Actually we didn’t see any tiny planes landing nor any people swimming, not even any water. We did observe what appeared to be a photo shoot taking place on the field at the foot of the hill. It was good we had decided to hold off visiting the Museum Building until after being outdoors for a couple hours. The closer we got to its front door, the more we needed the cool interior. Even so, I was drawn first to another set of doors, Arnaldo Pomodoro‘s “The Pietrarubbia Group.” Great steel portals with bronze, fiberglass, and marble doors commemorate a village near the artist’s Italian birthplace. When I could take my eyes off the highly textural doors, the door frame framed a view of the mountain ridge. The residence that is now the Museum Building was built in 1935 from Breakneck granite stones salvaged from Danskammer, an 1834 mansion that overlooked the Hudson River near Newburgh, New York, for almost 100 years. The Hatch residence’s formal garden also incorporated five Ionic columns from Danskammer’s front. The house is now used for gallery space. One room is filled with five of the early purchase of thirteen David Smith sculptures. 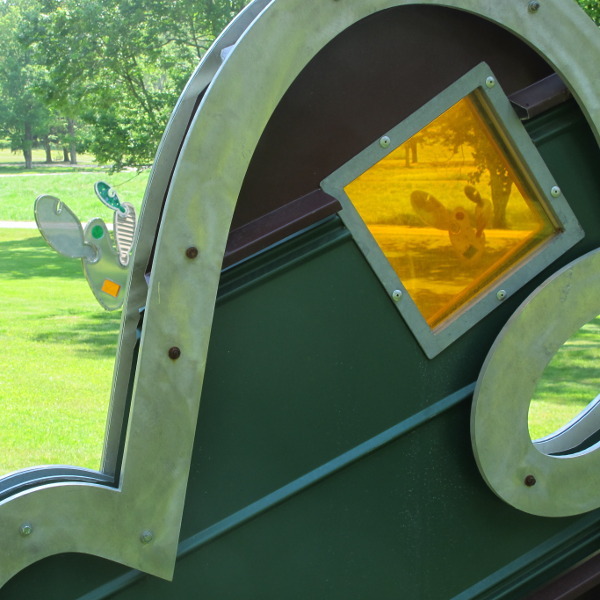 Although Smith conceived of all his sculptures as outdoor installations, these pieces were too fragile to be exposed to the weather at Storm King. In another room we found Louise Nevelson and Louise Bourgeois..
At the time of our visit, several rooms, downstairs and upstairs, were devoted to portions of the Dennis Oppenheim exhibit, including many concept drawings and photographs of large-scale “terrestrial” installations. In the hall we saw “Shirt Factory,” a three-foot tall acrylic and steel construction that looks like a shirt and houses a water pump. 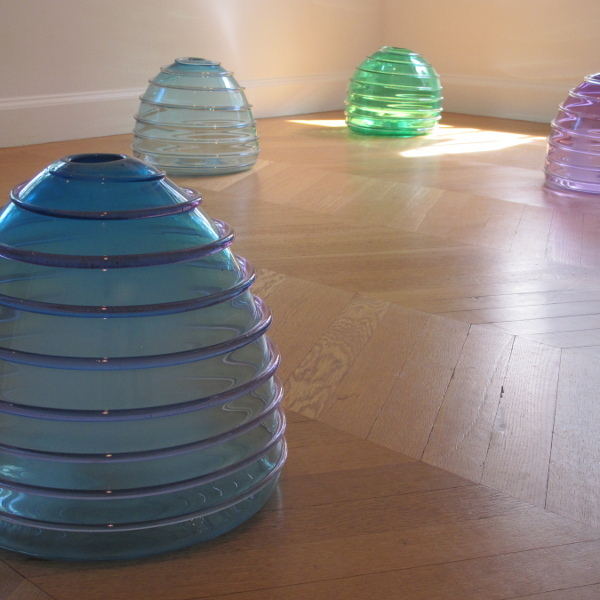 My favorite room held “Bee Hive–Volcano,” blown glass forms suffused with sunlight from the windows. A window at the end of the second floor gave us an elevated view of Oppenheim’s “Entrance to a Garden,” an almost two-story representation of a blue suit jacket, shirt, and tie. Made of semi-transparent, perforated metal panels, the sculpture has a tunnel where a jacket would button. Later we would walk through that opening to a tiny enclosed garden laid out like a flat white shirt with a collar bench and two short, columnar buttons where one can sit to reflect on the working life. Just as when we entered, we emerged from the house listening to an Oppenheim sound installation. The late afternoon was still very warm and we felt like we had only enough energy to walk the distance to our car. However after descending Museum Hill we were tempted into the South Fields to see a few of the monumental sculptures at close range. While walking around lyrical “Mozart’s Birthday” (Mark Di Suvero), we noticed the photo shoot crew moving into the South Fields. Perhaps some day we will notice an ad with “Mon Pere, Mon Pere” or “Jambalaya” beyond the model. And then it was time for us to move on. One afternoon at Storm King was not enough time to see everything. We look forward to another visit.